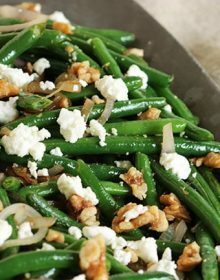 A simple side dish made stellar, creamy goat cheese, sweet shallots and crunchy walnuts add a wonderful contrast to green beans that have been blanched and sautéed in a bit of butter. 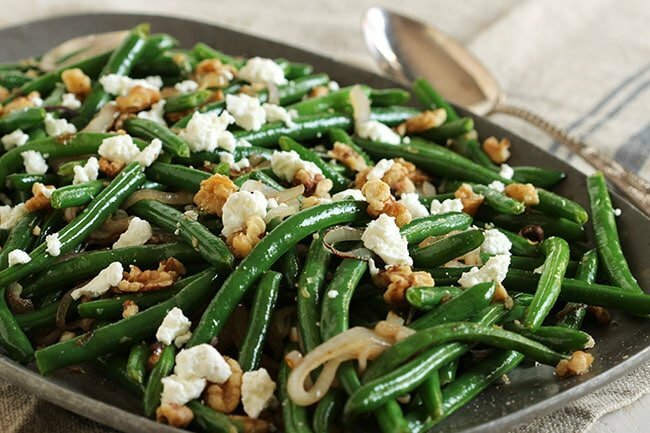 Green Beans with Goat Cheese, Shallots and Walnuts make a beautiful accompaniment to a variety of main dishes and can be served hot or at room temperature. How was everyone’s Labor Day weekend? Did you all enjoy the last few “unofficial” days of summer? I had planned to spend the weekend at the beach with my family but decided to hang back for a variety of reasons. 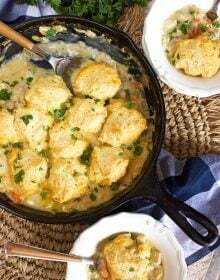 Instead….I worked most of the weekend updating a few recipe photos from back in the day when I didn’t know what the heck I was doing and posted what looked to be the equivalent of dog food right here on the Soapbox. The reshoot ended up being dinner and, like always, I needed something “green” to eat. It’s a rule for me…unless I’m eating a burger, then…for some reason…that rule doesn’t apply. Since I was reworking my turkey meatloaf recipe and I wanted to shoot it with some mashed potatoes…I made THESE mashed potatoes and ended up reshooting them too. 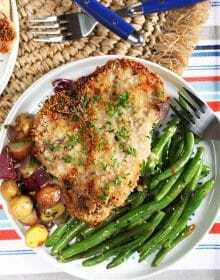 And since I always have peas or green beans with my meatloaf (the something green), I decided to whip up a favorite green bean recipe….and shoot that too. It was a full day or work but, as you can see, I was rewarded with an epic cool weather dinner. Even though it was 95 degrees with a zillion percent humidity. It was pretty amazing and I don’t know a lot of people that take the extra 30 seconds to really hit a home run with their side dishes. Most of the time, I just use a bag of frozen peas to add my green element to my meal. But this time….I went all “holiday dish” with my green beans. And I’ve done this before, in fact, I have about a dozen ways to amp up your green beans that I’ll start sharing here. 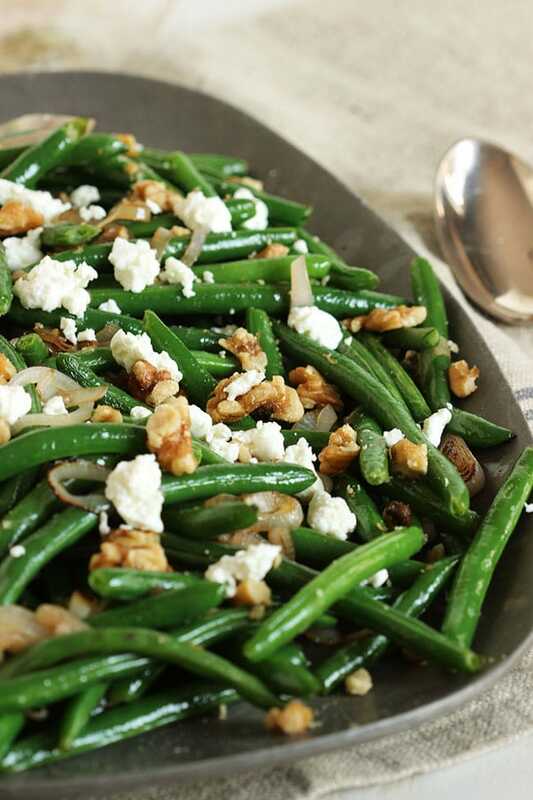 They’re all so easy and these Green Beans with Goat Cheese, Shallots and Walnuts are my absolute favorite. The creamy, tangy goat cheese melts just a tiny bit to coat the beans in a salty, amazing sauce and the shallots add a slight sweetness that pairs just wonderfully. The buttery walnuts add the perfect contrast in texture with their crunchiness. What I love the most about this side dish is it’s just as fabulous served at room temperature as it is when it’s served hot. 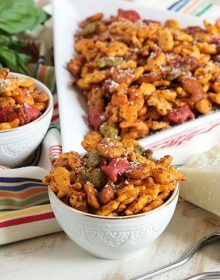 So, it’s perfect for those potluck dinners that start popping up around the holidays. 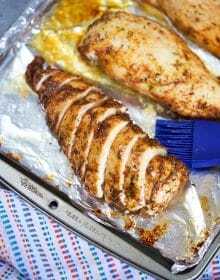 For what it’s worth…I hate potluck dinners so I just serve these with something like my meatloaf or a simple roasted chicken dinner. It’s great for entertaining and I don’t ask my guests to bring a thing….just their hungry selves. 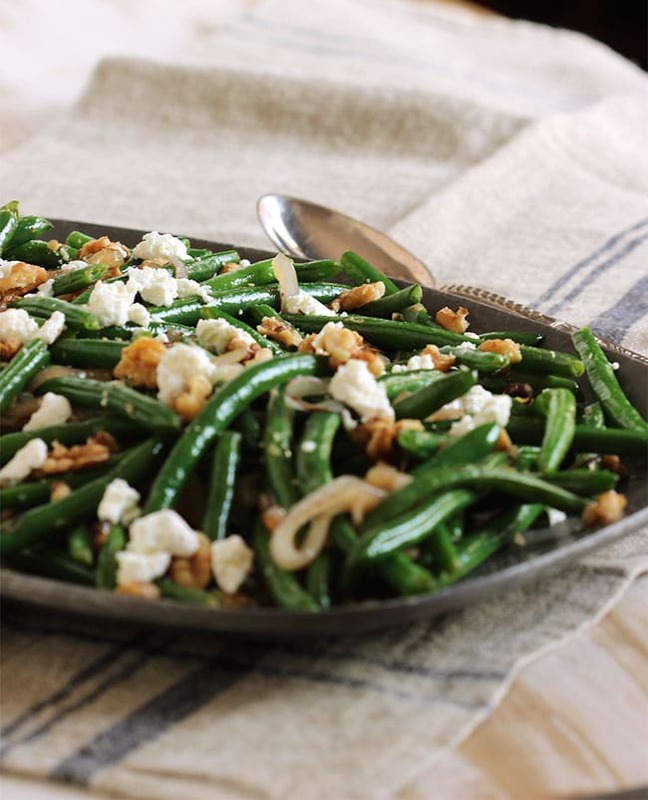 This super easy Green Beans with Goat Cheese is a fabulous side dish for any occasion. Bring a large pot of salted water to a boil and add the green beans. Blanch (cook) the green beans for 1-2 minutes until bright green and then, using a slotted spoon, transfer the beans to a bowl of ice water. (This will stop the cooking process and keep your beans from losing their bright green color.) Drain in a colander and set aside. Heat the olive oil in a large skillet over medium heat and add the shallots. Cook the shallots until softened and translucent. Add the butter and cook until melted. Stir in the green beans and cook for 4-5 minutes. Transfer the green beans to a bowl. Toss the beans with the salt, pepper, goat cheese and walnuts. Serve immediately. Love the fancied up green beans! 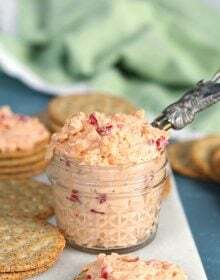 I could see this looking so pretty on a holiday table! 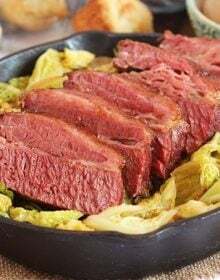 I’m going to add this to my Thanksgiving menu. It sounds wonderful and I love the goat cheese! The goat cheese is my favorite part. I love green beans, but I never know how to jazz them up. 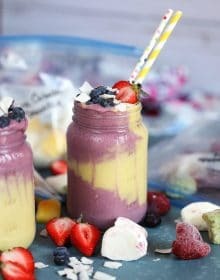 This recipe is gorgeous!! I love green bean dishes. They’re probably my favorite of all the fall veggies. I bet the goat cheese in this is awesome! Labor day was full of labor for us haha but I did get some cooking in! i bet these gren beans were perfect with the meatloaf and mashed potatoes! Ha ha!!!! I hate labor filled labor days. 🙂 Hope you’re enjoying your new home! 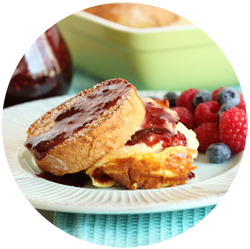 I need to re-shoot some of my old recipes, too – that first year was a disaster zone of photography! I could happily eat these green beans as my entire meal. 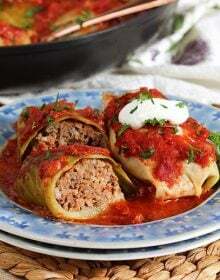 I have a list of recipes that desperately need new photos…this dish is gorgeous and delicious! Labor Day was awesome! Went to a ball game and had a picnic at the park with the kids! I am so loving the goat cheese on these green beans! I’m downright embarrassed of some of my older photos. Yikes! Perhaps I should spend a weekend at home, re-shooting… 🙂 Man, I LOVE green beans! This is my kind of dish! I really love dressing up side dishes like this. And because I do, when we go super simple with side dishes, that feels special too (weird, probably). This looks delicious! What a great side dish! I love the addition of creamy goat cheese and crunchy walnuts. I would be all over this dish…yum! HI could I serve this as a cold side salad and maybe use feta cheese instead of goat cheese? You could definitely serve as a cold side salad with feta instead of goat cheese! Just made these and totally delicious. Thanks for a more creative way to have green beans! Thank you so much! So glad you enjoyed them!